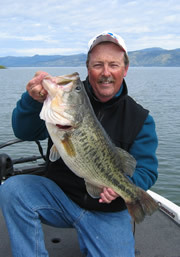 Welcome to Clear Lake Guide Service, based out of Kelseyville, California! We're here to help you enjoy your day at the lake. We have excellent coaching and people skills, and we go to every length to make everybody comfortable. Experienced, beginners, youngsters, and even people with special challenges have used our services and reached their goals for their day on the water. We love to fish, and enjoy sharing the experience with the folks who step into our office.